Attention! Osprey Kestrel & Kyte (women's counterpart) Series are updated in 2019! But we all know that the question here is - does it really WORTH going for the new 2019 model instead of the previous models? My short answer is: Yes it does. Horizontal installment to side mesh water bottle holders! This is one of the updates that I'm happiest about. You can now access these side pockets while wearing the pack. I had considered this as one of the main downsides of the 2016 model, so it's really a good advantage. Larger hip belt pockets - which can fit in even very large smartphones now (2016 model can't)! Better buckle construction and durability - critical for the life of pack. But because Osprey packs are already very durable and they offer lifetime warranty, I don't really care for this update a lot - buckles were already pretty solid. Appearance and colors. The famous Jungle Green color is gone! And instead, now they offer Kestrel's in Picholine Green - which I think looks VERY pretty. Weight and dimensions. There is a very slight (not noticeable) difference in weight - 2019 Kyte 36 is less than 0.1 lbs lighter than the 2016 model. Somewhat thicker material. This is more of a subtle update, and not many people talk about it, but it very slightly adds to the life of pack, and it also feels "smoother". If you're looking for a larger one, make sure checking out my review of Kestrel 48 - 10 L larger. 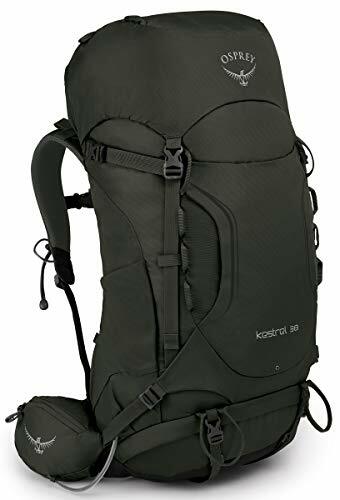 Osprey Kestrel 38 | $159.95 is a very comfortable, adjustable all-purpose pack designed for both outdoors and traveling. Although its height isn't technically carry-on sized, you're likely to get away with it more times than not since it's mostly down to individual staff. Make sure checking out Kestrel 38 vs 48 comparison before your final decision. We recommend this pack to everyone who are looking for a simple, lightweight, do-it-all backpack. See our women's Osprey Kyte 36 vs 46 comparison. Comfort is increased by ample and thick padding throughout the whole back surface. Total moment applied by the pack load is decreased and a healthier weight distribution is achieved since the pack and hence the load is held closer to your body completely flat against your back. Ultimately hip muscles which are the strongest muscles in human body as it's stated by Joseph in 2013 are included more in motion and keeping you less exhausted. Texture is constructed with full of corridor-like gaps and stripes in various heights in order to let air flow between the users back and the back of the backpack and keep them less sweaty with decent ventilation along the way. I have yet to see a pack that will keep you completely dry especially on warmer days even though I think Kestrel (AirScape) is one of the closest designs to the perfect balance between comfort and ventilation. AirScape backpanel of the recent model (left) is completely redesigned for superior performance. If nothing else, I guarantee that you'll sweat much later compared to most backpacks... except packs with AG (AntiGravity) system. As it's the same deal with almost all Osprey technical packs, shoulder straps are very well padded and thick with air mesh. Along with the S/M and M/L size options, harness is even further adjustable to ensure seamless fit. With the upgraded recent model now load lifters meet the ideal 45-60 degree angle  unlike the previous version and assist with the customized fit. There is also an emergency whistle embedded in sternum strap buckle. Hip belt is equipped with thick and ample padding similar to shoulder straps. My gripe with the 2016 model was that although it's amazing to have very readily available pockets within your reach at any moment, they were a bit too small - especially for larger smartphones. But, one of the biggest update made in 2019 is that they're made larger and now you can fit almost any phone inside. Material isn't very stiff. Your hip and waist feels more comfortable as long as you don't overstuff the pack (> 40 lbs) which is nearly impossible with packs with 38 liters of volume. Identical hip belt pockets offer plenty of room and are perfect for storing frequently used items. We all know the problems with items stuck within the center of the pack. Accessing them is a true hassle. You dig all the way through your items only to find that it's nearly impossible to find without unpacking. So you unpack. Sometimes completely. After you collect the item you repack your entire items. Sometimes it's even worse - you're outdoors and it's rainy, you're in the line for airport security check or you simply don't have the time or conditions. With Kestrel 38, this huge problem is solved once and for all. It provides a zippered side access to the main compartment. Extra accesses from side or front like Kestrel 38 or those of Aether AG products are literally clear level ups. Forget about wasting your energy, time or most importantly, your mood on it. You're literally one zipper away from your internal equipment. Now all your items are readily accessible. It's one of the most practical features a pack can provide. Top and bottom entrances are typical with Osprey products. Top entrance to the main compartment of Kestrel 38 is very wide. Now I'll mention the sleeping bag compartment. Sleeping bag compartment is located at the front bottom of the pack. Regular size sleeping bags can easily be stored within this compartment when the removable sleeping bag compartment divider isn't removed. Zippered sleeping bag compartment entrance. Sleeping pad straps aid attaching your pad outside the pack and allow extra room inside. You can remove the straps as well. Removable top lid is only available in Kestrel 58 and 68 packs which are not available in US markets (only in Europe). So top lid of Kestrel 38 isn't removable and its vertical position can't be customized. External top lid pocket is convenient for storing the items that are preferred to be readily available. It offers plenty of room and opens towards the backside. A mesh pocket is available at the opposide side of the lid. Using attached keyclip inside this mesh pocket you can easily isolate your keys from the rest of your equipments and not worry about them. There is a mesh pouch on the front surface. Mesh pouch on the fornt surface is typically used for storing wet, smelly or dirty items which are preferably set apart form the main core items. A zippered front pocket is missing - which would be nice to have. Unlike Kestrel 48, 58 and 68, Kestrel 38 doesn't feature any side pockets. Mesh water bottle holders at each side are very wide and deep. Using upper and lower side Osprey StraightJacket compression straps you can shrink and get all internal items together for ultimate stability and balance. Dual side compression straps of Osprey Kestrel 38. I've seen people complaining about lacking front compression straps. Since size is a choice of fit but not a choice of volume, the height of pack decreases with S/M size to correspond shorter torso and hence better fit. I wouldn't suggest most people to hike/camp with a 38 or 36 Liters pack for longer than 3 days. Now you're probably thinking that the dimensions must be incorrect because they result in nearly 100 liters of volume. Which means that in adition to dimensions, shape of the pack also contributes to the volume of the pack. Shape represented with the green line has larger volume than blue line. In US, the lowest carry-on luggage size I've seen so far is up to 22x14x9 inches (45 liters) which is the case for most airlines. So technically it isn't carry-on size for most airlines.. But, you can always shrink Kestrel 38 to smaller sizes with compression straps as well and usually carry-on allowance is down to individual staff at the airport. I had passed with my huge 65 liters of Deuter pack when the limit was supposed to be 45 liters for that specific airlines. But, of course, no-one can guarantee you that Kestrel 38 will always be allowed as a carry-on. Always check the regulations of your airlines before to be sure. If you're going to be buying the product in store, I recommend loading the pack with around 20 lbs of store weight before sizing. Also don't forget to go upstairs if available. You can evaluate your torso length at home with the help of Osprey’s very own Size & Fit article , and figure the corresponding size. I'm embedding the chart here as well. Kestrel is at 6th row. When someone asks me why they should purchase an Osprey pack, this is the number one thing I mention along with the harness and fit of Osprey packs. I've never been very kind to their packs and experienced literally zero problems so far. Pack comes with an attached raincover. It's a lifesaver when the weather is unpredictable. A wet is demanding to dry. Wet items can ruin your overall traveling/hiking expereince in minutes especially if you have electronics inside. Raincover of Kestrel 38. The design intention of distinctive color is to make the user more visible in case of emergencies like foul weather or blizzard. The hydration pouch of Kestrel 38 comes right behind the location that attaches shoulder straps and the back panel. Some packs are equipped with internal hydration pouch - at the opposite side of the backpanel. Internal pouch is far worse because most of the time the pack is overstuffed it's impossible to replenish the hydration bladder without unpacking the entire main compartment. Another reason is that you're always going to have to be cautious with the impacts you expose the pack. Spilled water and hence wet items can ruin your backpacking experience. Worse, if you have electronics inside, nothing can recover them. Using bungee tie off on the front side and tool loop aligned vertical below the tie off you can easily stow your ice tool and allow extra space inside the pack. There is one bungie tie off and one tool loop - on the right side of Kestrel 38. As the name implies, using the loops on strap and bottom side of the pack you can simply store your poles while wearing the pack. See the Storage section way above. Combining mesh water bottle holders with compression straps make carrying gear (especially long gear) practical. Combining daisy chains, paracord, scissors, pen and your survival skills, you can attach extra gear such as your shoes when the volume of Kestrel 38 falls short. Dual daisy chains of Kestrel 38. Available colors are Ash Grey, Dragon Red and Jungle Green. Osprey Kestrel 38 is designed to be used for outdoor events and traveling. It's supported by multiple tool attachments utilized for various outdoor activities with a carry-on friendly size for all airlines I've used so far. In my opinion, the best uses are travel and day hikes/daily outdoor activities. However, you might want to consider a stronger pack with larger volume if you're planning extended camping trips (3+ days) where you'll be walking for long.